Laurie Here - Contemporary Fiction and MORE - Book Reviews: #REVIEW AND MORE! 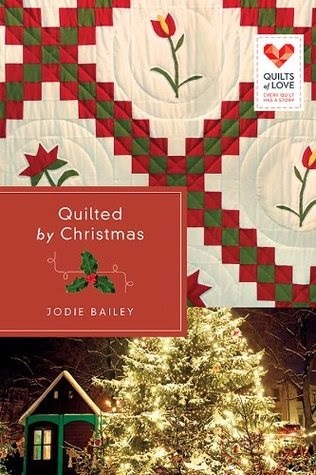 "Quilted by Christmas" by Jodie Bailey: A NEW Quilts of Love book! Enter a #Kindle #Giveaway and Merry Quilted #Facebook Party! #REVIEW AND MORE! "Quilted by Christmas" by Jodie Bailey: A NEW Quilts of Love book! Enter a #Kindle #Giveaway and Merry Quilted #Facebook Party! Reading ANY of the Quilts of Love books are like going on a new journey you've been dying to go on for forever! I LOVE these books! Of course, the Christmas books are always my favorites, but then again I'm a sucker for Christmas and all it's magic! (However ALL of these books are the perfect book to pick up no matter what season it is!) None of these books are in any order, so you can pick up any one, two, three or more and have a brand new story and be in heaven as you read! Taryn McKenna thinks she's an easy person to forget, even now at age 30. She definitely needs more self confidence, but after losing her parents when she was a young teenager, I can see how that could happen. Taryn is an extremely lucky girl in that her Grandparents took her in and have raised her since. Her Grandmother, Jemma, wants to finish an Irish Chain quilt (one of 'my' favorite patterns! One I that is on my bucket list! I've made a lot of quilts, but I LOVE this one and I think it's the BEST for Christmas!) for New Years Day for a very special and dear niece of hers, and every second of her time has been going into finishing up this quilt, yet things have been happening that makes it seem like they are keeping her away from it - ugh! Taryn has a secret, and only her Grandmother knows what it is, not even her old boyfriend, Justin knows it. Speaking of him, guess who's back after 12 years in the Army? Yep! Justin! They didn't leave on very good terms, in fact, it was quite a fight which they never forgave each other for, and both left feeling extremely hurt, however, they've never had a chance to forgive each other because they have never seen each other since. So yes, this book does hold some forgiveness in it, and maybe this just might be the key to happiness for Taryn, finally! This book (and entire series) is a Christian Fiction, so Taryn and the other characters have relied upon God to be their strength all of these years, and it has worked, for the most part, but even WAY cool Grandma Jemma learns a little more about this, too, even at her age, as she goes through a lot in this story, too. See, even these characters are written rich, warm, and like real people. You can't help but to love them and leave this book with a nice warm and fuzzy afterglow! I hope you love this book as much as I did! It is really a perfect read for any time of the year, but since this is such a christmas'y book, it will fit right into this holiday! A must-buy, must-read ASAP! I received this book for FREE from the Publisher, Abingdon Press, and NetGalley, in exchange to read and write a review about it. "Free" means I was provided with ZERO MONIES to do so, but to enjoy the pure pleasure of reading it and giving my own honest opinion no matter whether it is positive or negative. I am disclosing this information in accordance with the law set here: http://www.access.gpo.gov/nara/cfr/waisidx_03/16cfr255_03.html., The Federal Trade Commission's 16 CFR, Part 255, 16 CFR 255, Guides Concerning the Use of Endorsements and Testimonials in Advertising Federal Acquisition Regulation. Thanks for stopping by! Don't forget to enter the Giveaway and attend the Facebook party! If you've never been to a Facebook party, you don't know what you are missing! Plan on it! Mark that calendar! You don't even have to leave the comfort of your warm and cozy home during this crazy time of year with all those Christmas shoppers out there!